Been working on the initial player movement for ‘Jetboard Joust‘ (my ‘Skateboard Joust‘ sequel) this week which, of course, also entails thinking about how the gameplay is going to work. And the more I think about it the more I’m convinced that there’s enough ‘endless runners/jumpers/droppers/flappers/flyers/hoppers’ etc out there and I should really do something different. 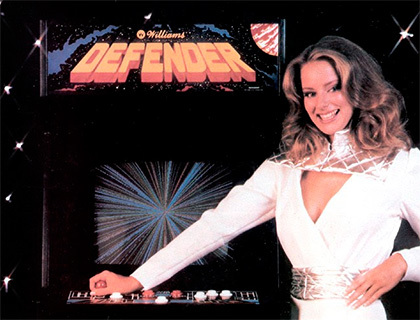 So I fancy making the gameplay similar to, possibly the greatest arcade game of all time, Williams ‘Defender‘. A scrolling world that loops back on itself with a set number of enemies to destroy per level. It’s a format that doesn’t get much love nowadays but I have such strong memories of being huddled in awe around a ‘Defender‘ cabinet after going swimming on a Saturday as a kid that I think I should pay some kind of tribute to it. Maybe the reason the format doesn’t see much action on mobile is that it requires a much greater degree of control than an ‘endless runner’. ‘Defender‘ had what seemed like a bewildering set of controls for an arcade game in it’s day. Of course, we’re all used to multi-button controllers nowadays but, as I wrote in a previous post, an iPad is most definitely NOT a gamepad so there’s no way I’m going to go down the fundamentally flawed ‘onscreen gamepad’ route. For the mobile version I want to keep the controls as simple as possible and control everything via tapping either on the left or right of the screen. After running a few tests I think I can get this to work – tap on one side to thrust, tap and hold to reverse direction. Tap on the other side to fire (hold to repeat fire for weapons that support it). Oh yeah – check out the parallax scrolling too! And I know the main character anims not working! This entry was written by bitbulldotcom, posted on December 10, 2015 at 10:38 am, filed under Art, Game Design, Jetboard Joust. Bookmark the permalink. Follow any comments here with the RSS feed for this post. Post a comment or leave a trackback: Trackback URL.